The Smart Solar Chameleon Solar Garden stake is a decorative light ideal for your garden. 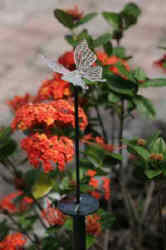 The energy-saving color changing LED light stake comes with a butterfly topper for seasonal use. The stake is powered by an integral solar panel and replaceable rechargeable Ni-MH battery that automatically turns on at dusk and off at dawn.